Whether you have the traditional Hard Disk Drives (HDDs) or Solid State Drives (SSDs), optimizing installed HDD/SSD is one of the best ways out there to speed up your Windows 10 PC. In fact, optimizing drive also helps you make your Windows 10 boot up faster. 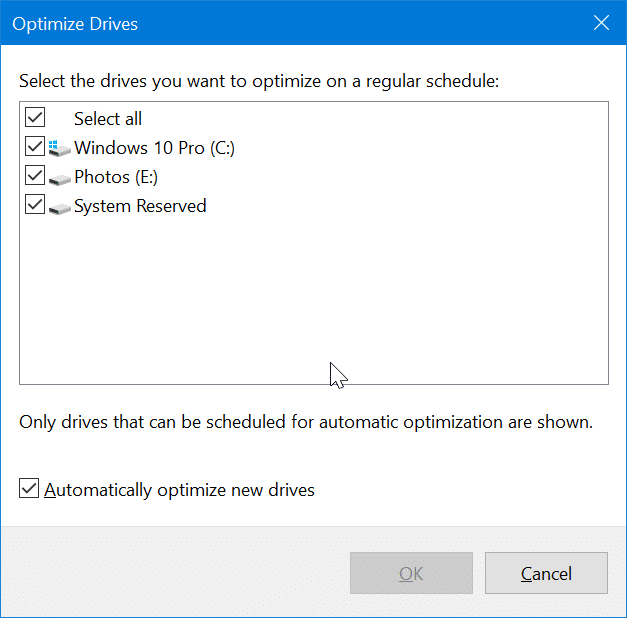 There is a built-in utility in Windows 10 to optimize drives. It supports both HDDs and SSDs. 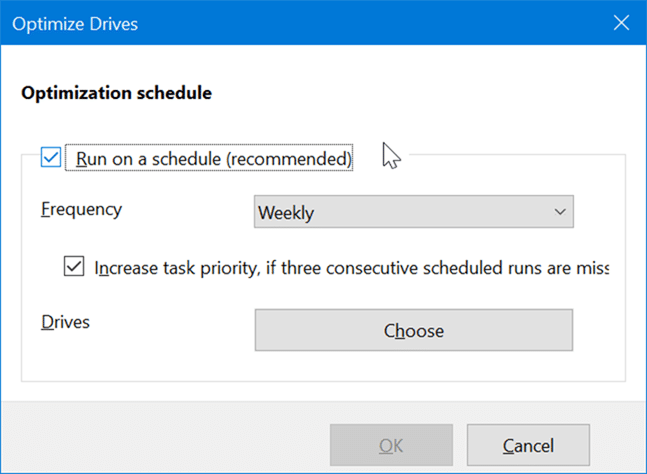 By default settings, the tool automatically optimizes drive once a week. If you want to check the drive status and optimize them manually, you can do so as well. It’s worth mentioning that only NTFS, FAT and FAT32 file systems are supported. If a drive is using any other file system, it cannot be optimized. Removable and network drives cannot be optimized. Step 1: Type Defragment and Optimize drives in the Start/taskbar search box and then hit Enter key to open Optimize Drives window. Step 2: As you can see in the picture below, the window lists all drives installed on and connected to your PC, including your removable USB drives. However, note that optimization service is not available is not available for USB drives and network drives. If you have HDDs installed on your PC, you will see how much of the drive is fragmented in the Current status column. For SSDs, the Current status column will display if the drive requires optimization (it the optimization was never run on that drive) or last optimized date if it’s recently optimized. Step 3: To optimize a drive, select it from the list and then click the Optimize button. If you have signed in with a non-admin account, you might need to enter the admin account password to optimize drives. 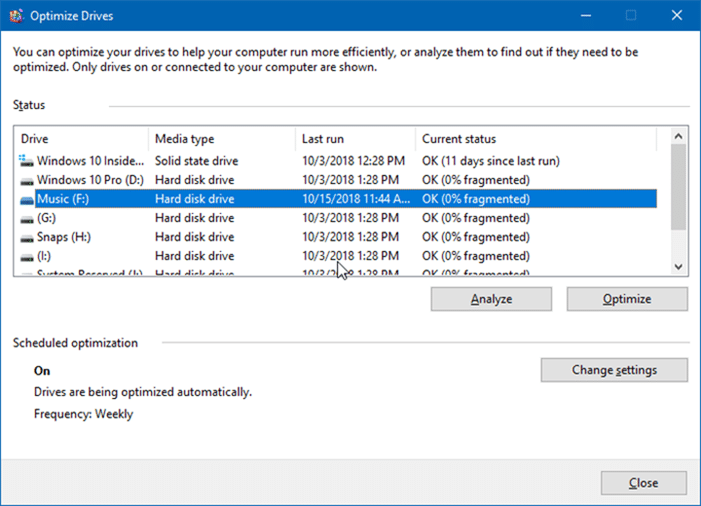 For HDDs, you can click on the Analyze button to check what percent of the drive is fragmented. After that, click on the Optimize button to defrag the drive. 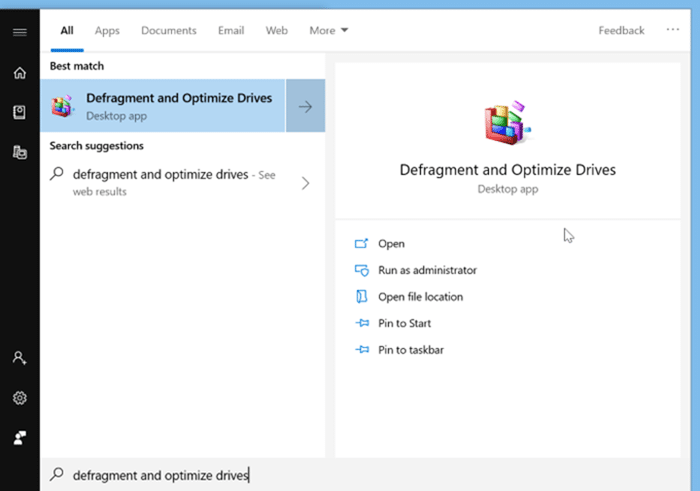 It might take minutes to hours to complete the defrag operation depending on how much the drive is fragmented. 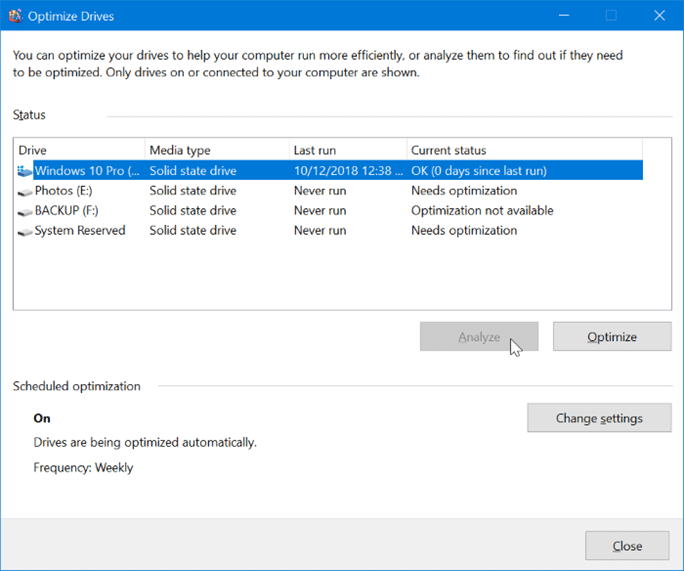 As said earlier, by default, Optimize Drive tool automatically runs once a week to optimizes drives. However, you can change the frequency to Daily or Monthly, and even stop the tool from automatically optimizing some drives or all drives. Step 1: Open Optimize Drives window by typing its name in the Start/taskbar search field. Step 2: In the Optimize Drives window, click the Change settings button. This will open a small dialog. Step 3: Make sure that Run on a schedule option is selected and then select either Daily, Weekly, or Monthly from the Frequency drop-down box. NOTE: To disable automatic drive optimization for all drives, uncheck Run on a schedule option. Step 4: By default settings, all drives installed on your PC are selected for optimization. 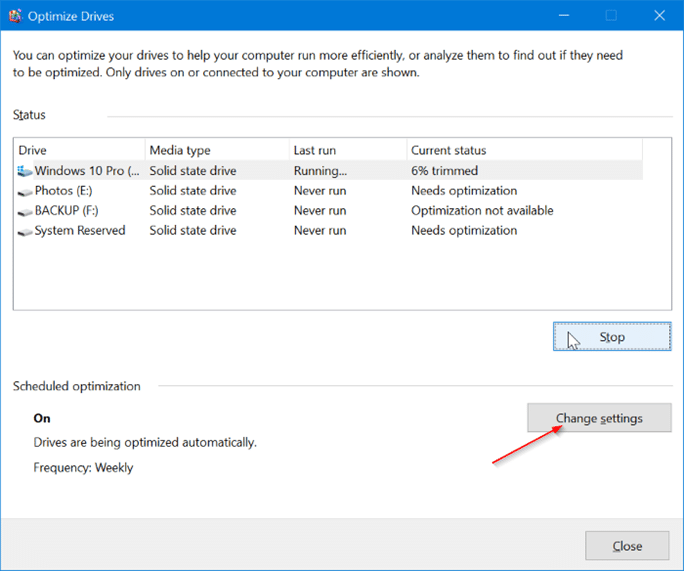 If you want to spare a drive, click the Choose button next to Drives option, and then uncheck drives that you don’t want to optimize automatically. Hope you find this guide helpful! OMG! You do NOT optimize SSD’s that way!! !